Only working intermittently whilst I am here and not in Oxford. 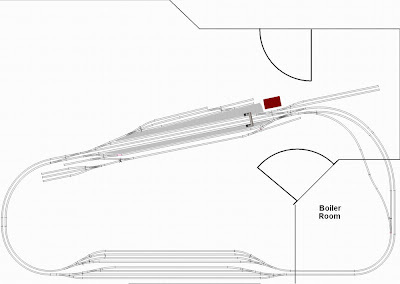 But I have settled on a track plan. Well I say settled it has been through about 40 revisions. I am using the freeware Xtrkcad, which is actually very good once you get up the learning curve. The room is about 5.5M by 4M at maximum, but it has the boiler room taking out a corner of it, and it is also narrower at that end. I have now built two of the trestles and have bought the wood for most of the rest, but not done much more, apart from succumbing to an occaisional shopaholic desire to purchase lovely models - mostly locomotives. I have been thinking and experimenting with couplings a lot and more on that anon.